A GYP-based package manager for C/C++ projects. Please check the latest issues, or contribute gypkg-projects to the wiki. All of this has to be repeated in every project, but fear not - gypkg fixes this and also a dependency management problem as well. Additionally, gypkg solves the problem with duplicate sub-dependencies (a depends on b and c; b depends on c). build command will install all dependencies into gypkg_deps and will update them automatically on next build call. gypkg supports local and remote (git) dependencies. Remote dependencies are installed into gypkg_deps/ folder in the root directory of the project (the one that has the main .gyp file). Nested dependencies still live in the same gypkg_deps/ in the root directory. git://github.com/author/project@semver [gpg] => ... - find the latest version tag matching semver and verify it's GPG signature and Git-EVTag-v0-SHA512. 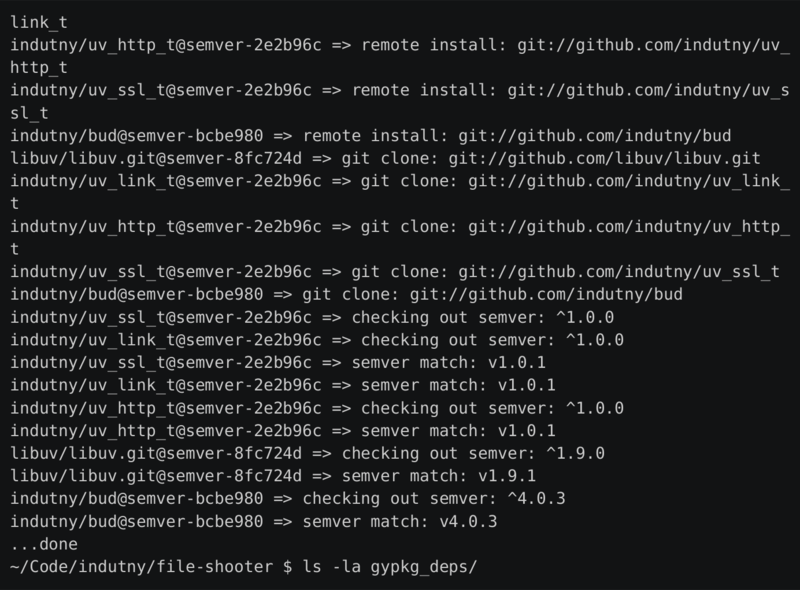 Note: this type of dependency will maintain a project local GPG keyrings for each github team name or explicit scope (specified with [gpg=scope-name]). gypkg build will ask for confirmation before adding any new keys to those keyrings. See Usage section above, or Examples below for particular gist of how GYP file may look like. While Node.js implementation of gypkg loads dependencies in asynchronously and in parallel, it may be required for gypkg-based project to be distributed to the platforms without Node.js binaries. In this case gypkg gen --freeze file.gyp can be used to generate .gypkg-freeze file, which will help ./shim/gypkg python shim in resolving all dependencies statically. .gypkg-freeze and ./shim/gypkg should be distributed with the project in such cases , and the project users should be advised to extend their PATH environment variable with a folder that contains ./shim/gypkg script. NOTE: no GPG signatures are checked in this mode, since it requires extensive Node.js-based tooling. gypkg is maintained by gypkg. This page was generated by GitHub Pages using the Cayman theme by Jason Long.